My entire team and I are delighted to welcome you to our newly renovated hotel. The ibis budget Hyères hotel is a friendly location for a wonderful holiday on the beach or by our swimming pool. 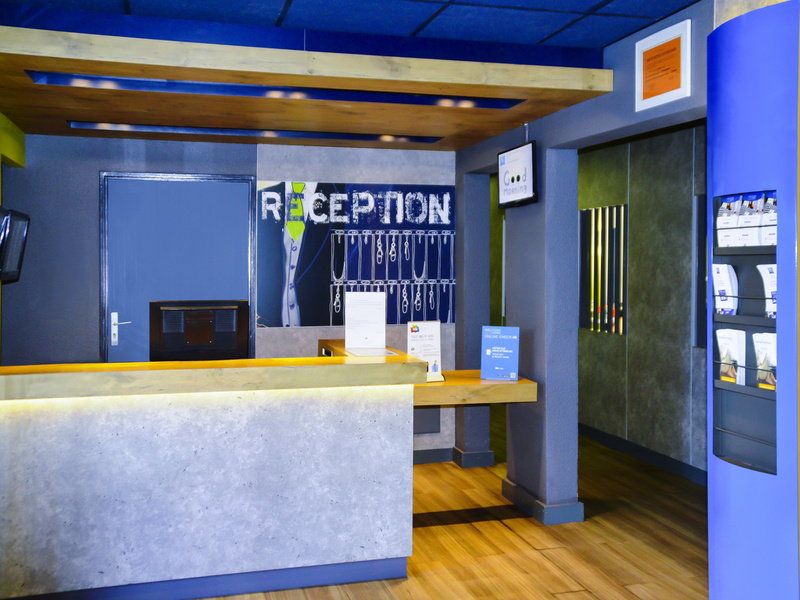 The ibis budget Hyères Centre Ville hotel is located a 7-min walk from the town center, 10 min from the port with a shuttle to the beaches from in front of the hotel. The ideal place to stay during your sporting events. After an excursion to the Îles d'Or islands of gold (Île du Levant, Port Cros and Porquerolles), a day at the beach or a sports competition, you can enjoy our pool from mid-April to mid-October. Our whole team is ready to welcome you and ensure that you have a great time in sunny Hyères. The ibis budget Hyères is characterized by its prime location in downtown Hyères, just a stone's throw away from monuments and landscaped gardens.The typical Provence market is held on Saturday mornings. The hotel is ideally located for direct access to the Toulon-Hyères airport, the SNCF train station, Toulon and Saint-Tropez. Triple Room with large bed and overhead bunk. Twin - room with two single beds for up to 2 people. + Comfy bed and clean room. - Small room, bathroom door didn't open unless you moved the bed. I booked an Ibis rather than an F1 for the sole reason of it having Air Conditioning but when we got there we were told it did not work! Really very annoyed. Offered a poor 20% discount - not enough. I hope for a refund on this please. We used 4 hotels (all Ibis group) and 2 earlier in the year so we try and be loyal but a poor experience in June at an F1 and this at Hyeres is testing my loyalty i'm afraid. It also doesn't appear that the 5% you offer members isn't really valid as i have done quotes with and without a code and they are the same. Nice hotel not far from city center. Major plus points for pool and AC. Major minus points for no luggage storage after check-out. I was flabbergasted, this was a first in 20 years of traveling, but it is supposedly the chain's policy. I would have been perfect if it wasn't for missing hot water during 24 hour period. Difficulty with booking. Had to recontact hotel 3 times and ended up with different room than the one booked! Workmen entering the room without knocking. Room really smsall. No shelf in bathroom. No storage for clothes.Stuff missing from room after cleaning. One of the bed unmade. Management not sympathetic to our complaints. Overall the checking was good plus the room was satisfactory. However I said I was dissatisfied as there was no hot water in the shower and wash basin - it was pretty chilly in Hyeres and so no shower or shaving that morning. Pleasant stay but noisy room. Pleasant welcome and sufficient comfort for this bedroom with an affordable pricing. A major problem comes from the very noisy environment due to insufficient noise abatment from the construction : you can hear people in the corridor and from the adjacent room as if they were in your own room ! Impossible to sleep after 7am, especially if your room is next to the elevator and works are in progress in the hotel beginning at 8am. The hotel was fine, maybe needs a refurb. The area around the hotel was dodgy. Lots of broken glass from smashed car windows in the vicinity. Breakfast was good. One night stay was enough. The hotel needs to be refreshed, the tap in the bathroom are not fixed properly in the wall the chrome colour of the shower tap is gone after a few year of used...... The team of this hotel is really friendly, professional, ready to help eg : map, calling a taxi, asking if everything was OK. I am used to nicer ibis budget in Lyon so I was disappointed. The location was a little scary at night. The staff was very nice and helpful. The first night we had tons of ants in the room and my 5 yr old niece was scared to sleep but we changed rooms the next day. The bunk bed was hard to climb and we bumped our heads several times on the ladder. I got another room for myself so that my companions would not need the bunk bed. I would use ibis budget hotels in the future but not this location which I chose for its proximity to my sister's house whom I was visiting.